We put the new Neo airbrush through its paces and see what it's capable of. The Neo is (literally) easy to get to grips with. This kit includes a 0.35mm gravity-feed airbrush, which comes with a dual-action trigger, and affords great control over your painting techniques, whether you’re covering backgrounds or creating fine detail. The three-speed compressor includes a rubber hose that screws onto the airbrush. However, the push-fit seal with the compressor is tight enough now, but it could potentially become a weak point with continual use, so I’d be inclined to keep it attached. Simply press on the power button to cycle through the three speeds ranging from 4–15 psi (clearly indicated by a colour change on the button). These speeds are great, whether you’re just starting out with the airbrushing technique or are very experienced. The lower speed provides more control for all, but also allows greater detail to be achieved. My only real grumble is that, in general use, I found the compressor to be a little on the noisy side, but the clatter is easily reduced by placing the Neo on a mat or soft surface. There are three speeds, meaning coverage and application can be easily controlled depending on the level of detail needed. Retailing around £190, this kit has everything a beginner needs to explore airbrushing and it’s one of the best value-for-money kits around. 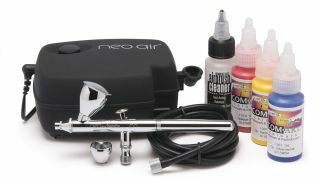 Included is the compressor and airbrush (with two cup sizes), three bottles of water-based acrylic paint, a water-based cleaner, and online access to basic airbrushing techniques and lessons. You can also buy the airbrush individually for around £65. Fine artists and modellers will find this a welcome addition to their other kit. The compressor is designed for small applications, so larger scale usage requires something more suited to studio use, but for beginners, it’s a great starting point. This article was originally published in Paint & Draw issue 02. Buy it here.